Crop circles - For agriculturists. Explanation, decipher, decode, discovery, break code, explaining, decryption, puzzle out, scientific research. Better barley, malt, beer, brewery, brewing. Although in earlier times, certainly not as much as today. There were not in the world even as many fields, neither human nor crop. Small extent would occur in ancient times, indicate some messages. Good news (from Professor Farnsworth) for agriculturists. Not only for them, but also for sheriffs, policemans and any other interested people. Clear away all your hayforks, pop-guns, shotguns, revolvers, colts, knifes and any other weapons, you will never need it to punish or drive away any circlemakers. That simple reason is - they have never existed (Crop-Circle-makers). Better beer, brewery, malt, whisky, brewing, barley. The one who really created that patterns, you would never get caught, quite the contrary. It is really the best to keep out of him as well as possible. They were namely the lightnings storms, which could also take place several weeks before a patterns emerged. Really, nobody (no real person) will come to make any figures in your fields. And if He will (that real reason), hurry up to the church and give many thanks to God, that you did not meet him there, "in time". That real causes of making figures in your fields were only lightnings during thunderstorms. Maybe also a bolts from the blue. Neither wind even rain. Both of these listed causes are in creating of lodged (damaged, weakened) crop areas participated only very slightly. 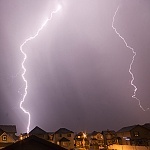 If it were not for the root cause, the lightning discharge, there would not be in the fields around the world lodged (damaged, weakened) almost nothing. Only hailstones may cause similar effects, but rather much worse - after that is the crop completely destroyed. Crop lodged (damaged, weakened) after the lightning discharge may still very often recover enough so that is possible to harvest. Estimate (to be precise) in the world hails cause only about a thousandth of a percentage of damaged crop, compared with areas that are yearly lodged (damaged, weakened) by lightning. One of the most interesting (also amazing) fact is that thunderstorms and lightnings appeared mostly many days, even after weeks before figures really became visible. Sometime more two months. Doug and Dave? And some other "declarators"? Oh, damned. Better beer, brewing, malt, barley, brewery, whiskey. Do not harvest any Crop Circles before ripened. Absolute unnecessary work. That crop became flattened (damaged, weakened) like any other lodged (damaged, weakened) crop in the world, but only thanks to very anomalous circumstances, once from many millions of other cases, has became a symmetric figure. Better brewing, barley, malt, brewery, beer, whisky. No matter, the longer time from now, the less interest of anybody in those figures. Especially after warning. Maybe absolute no new interest after that. Just were not nearly to the extent observed, examined nor photographed. In earlier centuries was not nearly as much rogallists and airplane owners as today. As well as camera owners. In the mid-19th century were walking through the county over the world's first few owners of Daguerre apparatus. But they were interested in much many other things, than Crop Circles. But if after all were recorded, with a relatively high probability were recorded in the form of painting records and occur as well as illustrations of some ancient civilizations. Only this fact has not been revealed yet. Records of ancient civilizations are opened to todays researchers more and more. Even some key images of ancient cultures might be drawn from patterns in the grain, such as Yin - Yang symbol, or some ancient Mayan figures. In those days were of course treated as a work of God, and they were properly treated. As the greatest paradox is possible to consider the fact that it is not impossible that some ancient civilizations may even reach to the realization that the crop patterns are formed after discharge of lightning. But then did not need this fact in no way further explore and develop it even further to deal with, because both the discharge of lightning, so the shapes generated by it they considered all as a work of God. Their access to them could be in both cases very similar and did not need any elaborate or record the fact that one can arise in relation to the other, either because the author was for them in both cases one and the same - god Zeus Thunderer and equivalents, and similar considerations they expected from anyone who will be dealing with their depictions in the future. It is therefore very likely that in the case of most advanced ancient civilizations will be any image that may be fairly accurate reproduction patterns found in crop, combined with the representation of the highest gods or God. Whether they understood that the patterns were formed by lightning discharges or not. If all that two structures are considered as a work of God, it's almost the same. It is even possible to say that it was much better than today's mankind thinking, even if they did not understand their interconnections. There is still much more straightforward assumption Lightning - God, crop circles - God, than today's humanity laborious derivation of lightning - nature, crop circles - aliens. By the way, would be it possible be after all, those lightnings produced really by aliens? It would have been necessary to ask masters professors Uman and Rakov from the University of Florida (www.ufl.edu), but they both will really difficult to agree with something like that. In any publication, which were by these two "gurus" World Science lightning discharges written, are not about aliens even any mention, not a peanut, even if they wrote about discharges for instance on Venus or Jupiter. not excessively. They are not manufactured by any semi intelligent, demented and senile circlemakers, or aliens (also semi intelligent, demented and senile). For their existence is not to be angry at anyone even him for that prosecute or punish. Crop in any regular patterns is lodged (damaged, weakened) for the very same reasons which caused the damaging and lodging (damaging, weakening) of crop anywhere in the world. 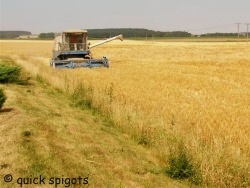 Anyone who encounters with any pattern in crop, even if they did not show any signs of regularity, and who meets with any flattened (damaged, weakened) crop anywhere in the world, may only congratulate himself that was not exactly in that place precisely at the time when there was that concrete pattern really originated (recorded, exposed). Absolutely no matter if regularly symmetrical or complete randomly irregular. If, despite all that anyone will continue to maintain that some patterns in crop fields were produced by him, it is in no way necessary to disprove him. No choice but just to wish him good luck, that has never met in the field with that one who figures in the crop really actually produced. Probably would be the best place such an individual in an Institute (madhouse) what are many around the world, and where are for the purposes of storage and harboring with similar structures properly equipped.